Hardcover, 7 in. x 10 in. 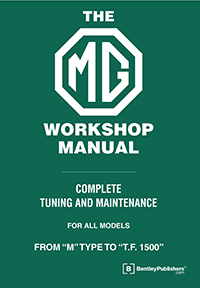 The MG Workshop Manual: 1929-1955 is the classic MG service manual recommended by the factory and known simply among MG enthusiasts as the "Blower Book" - a tribute to its author. 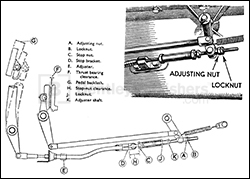 It provides tuning and maintenance procedures for MGs from the first "M" type Midget of 1929 through the TF 1500. As you would expect, the official MG repair information is given for normal maintenance and repair, along with complete specification data sheets, lubrication charts, wiring diagrams, and a complete list of engine parts. High-performance information covering supercharger installation, and the factory's Special Tuning Handbooks for Trials Work are also included, which will be of particular interest to vintage and historic racers. 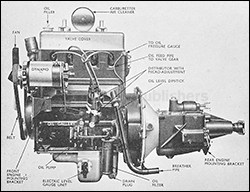 With plenty of detailed technical information for pre-war MG models, as well as some post-war models, including a chapter on rebuilding Wilson pre-selector transmissions for K3s, The MG Workshop Manual: 1929-1955 is a useful source of specifications and information for the MG restorer or enthusiast. Fig. 69. View of 1 1/2 Litre Engine, left hand side. Fig. 2. 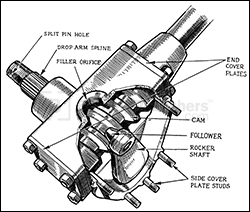 The Bishop cam steering.